Neta Crawford, Amy Goodman and Juan Gonzalez. Nearly half a million people have died from violence in Iraq, Afghanistan and Pakistan since George W. Bush declared a “war on terror” in the wake of 9/11, according to a major new report from Brown University’s Costs of War Project. 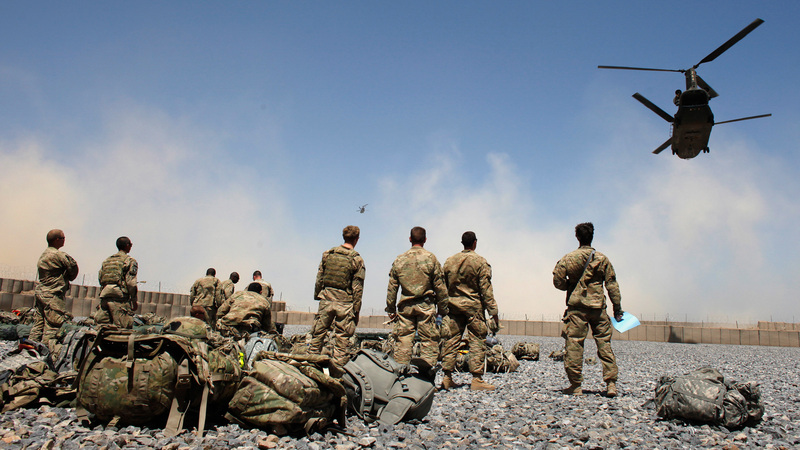 More than 17 years later, the war in Afghanistan is the longest war in U.S. history. Costs of War reports that more than 480,000 people have died from violence in Iraq, Afghanistan and Pakistan—including soldiers, militants, police, contractors, journalists, humanitarian workers and civilians. Several times as many people have died indirectly because of water loss, sewage and other infrastructural problems, and war-related disease. The wars have uprooted 21 million Afghan, Iraqi, Pakistani and Syrian people who are now refugees of war or internally displaced. The cost of the global so-called war on terror will soon surpass $6 trillion. We speak with Neta Crawford, director of the Costs of War Project. She is a professor and department chair of political science at Boston University. JUAN GONZÁLEZ: We end today’s show with the costs of America’s endless war in the Middle East, as a new report reveals that nearly half a million people have died from violence in Iraq, Afghanistan and Pakistan since 2001, when George W. Bush declared a “war on terror” in the wake of September 11th. PRESIDENT GEORGE W. BUSH: This war on terrorism is going to take a while. And the American people must be patient. … It is time for us to win the first war of the 21st century decisively, so that our children and our grandchildren can live peacefully into the 21st century. JUAN GONZÁLEZ: President Bush referred to the war as a “crusade.” More than 17 years later, the war in Afghanistan is the longest in U.S. history. A major new report from Brown University’s Costs of War Project has found that more than 480,000 people have died from violence in Iraq, Afghanistan and Pakistan, including soldiers, militants, police, contractors, journalists, humanitarian workers and civilians. Several times as many people have died indirectly because of water loss, sewage and other infrastructural problems, and war-related disease. The wars have uprooted 21 million Afghan, Iraqi, Pakistani and Syrian people, who are now refugees of war or internally displaced. AMY GOODMAN: Costs of War also looks at the ballooning financial costs of the wars, with the U.S. spending close to $6 trillion through 2019, including for veterans’ benefits, medical treatment over the next 40 years. Interest costs would add another $8 trillion in the next four decades. This comes as President Trump has signed a $674 billion military budget in September for the 2019 fiscal year. For more, we go to Neta Crawford, the director of Costs of War Project, author of the report just out both on the financial costs and human toll of the so-called global war on terror, professor and department chair of political science at Boston University. Professor Crawford, thanks for joining us. Tell us what you have found at this point. NETA CRAWFORD: Well, we found that after 17 years, these wars are at stalemate, and we have plans to keep going. We’re going to spend probably another $100 billion over the next five years. That is in addition to the nearly $6 trillion that we’ve already spent and obligated. JUAN GONZÁLEZ: And, Professor Crawford, in terms of—the American people largely see these wars as winding down, obviously, as more and more U.S. troops are pulled out. But yet, the death toll, especially in places like Afghanistan, seems to be on the increase. NETA CRAWFORD: That’s right. In Afghanistan, the number of suicide attacks by militants or the fighting between the militants and the forces of the U.S. and the Afghan military and police is increasing in some areas. And, in fact, the U.S. military sees this war as basically at a stalemate. And that’s in part why the United States has moved toward negotiations with Taliban. AMY GOODMAN: Can you talk about why you did this report, and the astronomical costs, most importantly, human lives, but also the financial costs? NETA CRAWFORD: Well, we wanted to highlight both the cost to Americans in terms of U.S. soldiers and sailors who have lost their lives—about 7,000 people—but, in addition, remind us all that contractors—more contractors, in fact, have died because of their involvement in these wars than soldiers and sailors—and that, of course, many thousands of civilians have been killed, wounded and displaced. Many millions have been killed, wounded and displaced. JUAN GONZÁLEZ: And generally what happens—you mentioned the contractors, but again, the reason the American public rarely hears about this is that even the contractors that are brought into places like Afghanistan and Iraq generally employ people that are not Americans. And so, basically, the toll is internationalized, and the American public doesn’t really get a sense of what’s actually going on. NETA CRAWFORD: Right. A lot of these wars is now sort of externalized or displaced. So, think about the contractors. As you’ve said, they’re from other places, but they work for and are paid for by U.S. corporations. But other things are externalized. So, for instance, the healthcare costs of the veterans. Yes, billions are paid for the veterans in a hundred—I’m sorry, the 3 million U.S. veterans that are home now, some of them are on disability. That’s being paid for by the U.S. government, but some of those costs are actually borne by the families of veterans. So, much of what is spent, we actually can’t account for, because it’s—these costs are borne by other people. So, when people are injured or killed in war zones, yes, we hear about it, but that’s just the tip of the iceberg, I think, in terms of direct and indirect death. AMY GOODMAN: Do you think there—go ahead. NETA CRAWFORD: Yeah, these wars are actually leaving the war zones in rubble. And you haven’t mentioned Pakistan yet, but the United States has also been, through drone strikes and other action, fighting in Pakistan since 2002 in order to chase and defeat Taliban, al-Qaeda and now ISIS. So, the war zones are actually expanded from what we thought they would be in 2001, 2002, 2003. Now the U.S. forces are operating between 80 to 90 countries all over the world. AMY GOODMAN: And the relation between war and climate change? You say the Pentagon is the single largest user of petroleum? NETA CRAWFORD: That’s right. Between 2010 and 2015, the Pentagon used about 105 billion barrels of oil, on average, each year. They’ve tried to economize, because, obviously, that’s expensive, but it is the single largest producer of greenhouse gases in the United States and abroad. JUAN GONZÁLEZ: And briefly, how were you able to conduct this research, given how little attention the U.S. government or the Afghan government actually pays to accounting, the toll of people killed as a result of these battles and these attacks? NETA CRAWFORD: Right. Well, things have gotten harder. For example, the special inspector general for Afghanistan reconstruction, who investigates U.S. operations, looking for waste, fraud and abuse, has not been able to release to the American public figures that were previously known about the number of Afghan soldiers and police killed in these wars. So the Afghan people know that their soldiers are paying a high price in death and injury, but the American people don’t know that. And we don’t know how large even the Afghan military is. There are other pieces of information that were previously available which have essentially disappeared down a memory hole or been sort of given to us in a barrage of information, sort of a firehose of information, so we can’t pick out the relevant details. So, in a sense, it has become harder to do these reports because there’s more information withheld. AMY GOODMAN: Neta Crawford, we have to leave it there, co-director of the Costs of War Project. We’ll link to your report, professor and department chair of political science at Boston University. Neta Crawford is co-director of the Costs of War Project. She is a professor and department chair of political science at Boston University. Posted on ZCommunications November 25, 2018, from Democracy Now.